Cataloging, writing bibliographies and sharing them with others is part of my nature. Mike Perschon a.k.a. Steampunk Scholar called me once “the ultimate steampunk librarian”. He was probably right—well, except for the “ultimate” part, of course. For seven years, from 2003 through mid-2010, I worked as a self-appointed steampunk librarian, trying to create an online catalogue of all steampunk books, films, comics, games and interesting websites from virtually every corner of the world. 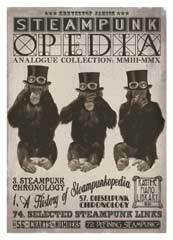 The name of the project was "Steampunkopedia"; some of you may even remember its weekly updates. Although the website has been closed down, most of its resources are available again, packed into this single 80-page PDF booklet. The volume contains Steampunk Chronology (a list of over 3,000 steampunk and dieselpunk titles), links, definitions of the genre, charts etc.